Cafe Natrani, Darpana Academy, Ashram Road, Ahmedabad, Ashram Road, Central Ahmedabad, Usmanpura, Ahmedabad, Gujarat 380013, India. Tickets also available on Natarani app. Journey through Ages is a western classical piano recital, features music from 17th century till 21st century. 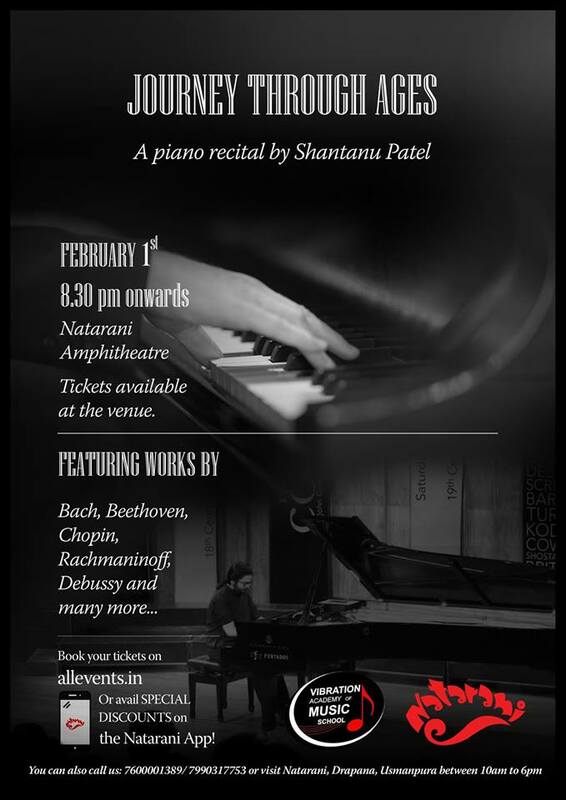 Pianist Shantanu Patel will perform music by well-known composers like Bach, Beethoven, Chopin, Brahms and Rachmaninoff along with a premiere of a new composition by an upcoming Indian composer Vivek Venugopal. Shantanu will also explain the facts and background of each work he performs along with how to perceive and enjoy western classical music which is yet at a very young age of its awareness in India.